The System Usability Scale (SUS) is a standardized metric for measuring the usability of a website or other interactive system. Long a favorite among UX researchers for its simplicity and accuracy, SUS is a valuable quantitative tool for anyone trying to optimize the user experience. SUS uses a short, 10-item questionnaire administered at the end of a usability test to calculate a website's score. Users respond to each question on a 5-point scale from “Strongly disagree” to “Strongly agree.” These answers are then used to generate an extremely reliable overall usability score for your site. Based on different studies, the mean SUS score is around 68-70.5. If your score falls close to this range, you can assume that your website‘s usability is about average. 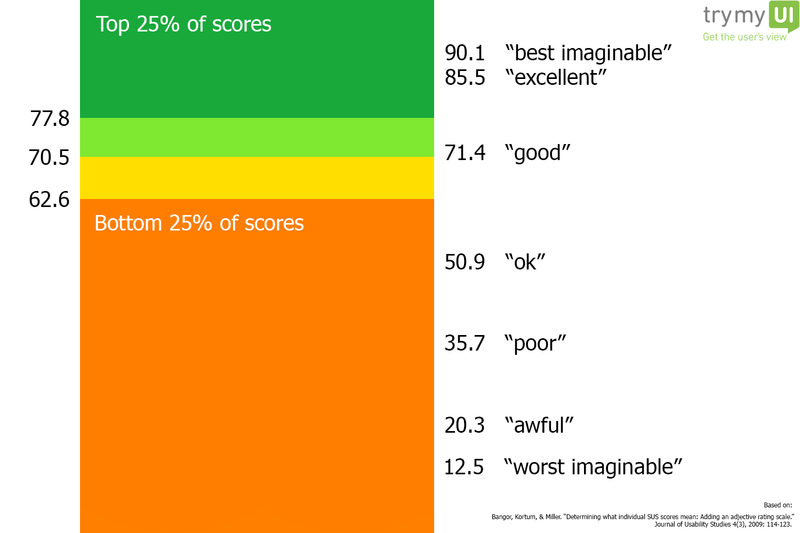 Some researchers have attempted to map adjectives like “excellent,” “poor,” or “worst imaginable” to different scores for an additional level of insight. For example, a 71.4 (just above average) corresponds to “good”: better than an “ok” 50.9 score, but falling short of an “excellent” 85.5. Another way to add meaning to your SUS score is to turn it into a percentile ranking. By comparing your results against hundreds or thousands of scores collected in other usability studies, you can contextualize your site’s performance relative to the rest of the web. So for example, an average score of 70.5 is in the 50th percentile (better than half of the sites tested) according to our database of 500 websites. Though described by its inventor as a “quick and dirty” measure, studies have found SUS to be among the most accurate and reliable of all usability surveys, across sample sizes. It is now one of the most popular metrics for quantifying system satisfaction, with thousands using it to gauge user-friendliness over a wide range of products online and off. All these qualities make SUS a valuable tool for standardizing a diverse mix of tester feedback, and aggregating responses into a meaningful, but concise, picture of your UX. If individual test videos are the trees, SUS shows you not only the forest, but the entire ecosystem. With a widely-trusted industry standard to rely on, you can take a step back from your own company and see how you chalk up in the broader world around you.